God's "Will" Versus God's "Work"
It is good to do the Lord's work, it is even better to do His will. There are many great Christian projects in which we could become involved. It is important, however, to be sure that we are do God's will not just his work. I don’t know who penned the phrase, "It is good to do the Lord’s work, but better still to do His will," but I love it. Just because a person is involved in a good Christian service does not mean he is doing what God wants him to do. Unfortunately, the difference between God’s will and our will (when it comes to Christian service) can sometimes be very difficult to see. Although these differences may appear subtle, they are, nevertheless, very important. The basic difference between God’s will and God’s work is when we are doing God’s will, God is working through our lives to do His work. However, when we are doing God’s work, we are acting on our own leading to accomplish a Christian project. In other words, although our work may be for a good cause, we are still doing our own thing. Instead of saying, "God, please show me what you want me to do next," some Christians say, "Lord, this is what I am going to do for you. Please bless it." We must limit ourselves to the ministries the Lord wants us to be in, not the ministries we want to be in. God will give you the desire to do His work. Our will is probably one of the largest factors hindering God from working in our lives. Our will must step aside before God can take full control of our lives. A minister once paraphrased the Lord’s prayer (Matthew 6:9-13) by saying, "... Thy kingdom come and my kingdom must leave. Thy will be done and my will must be smashed." There is nothing more important than God’s will, and it can only be found by denying my will. about you or about Jesus? "He has blood-poisoning in his left arm," my doctor whispered to my mom. "He’ll have to go to the hospital." After stepping into another room, the doctor said, "The vein above his elbow is septic and the infection is moving up toward his shoulder. If it gets past his shoulder, it’ll move quickly to his heart and he’ll die. We only have about a day to bring the infection under control with medication. I want to be honest with you, Mrs. Bronson, there is a good possibility we’re going to have to amputate." My mother was horrified. Many fears crossed her mind as she contemplated this seven-year-old growing up without an arm. She realized, of course, there have been many children who have overcome handicaps more severe than this, but she wanted to spare me the emotional pain. My mother was not as concerned with the physical limitations as she was with the emotional trauma that would follow. She knew how cruel kids at school can be and she would have given her own arm if it were possible. A battle began to rage within mom’s soul. She felt so helpless. She knew she would not have inner peace until she committed the problem to God, but she just could not let go. My mother struggled all day and into the night. Finally, sitting in the back of the hospital chapel, she surrendered everything. She committed it all to God and was now willing to accept whatever He had in mind. Peace rushed into her soul as she returned to the center of God’s will. Mom opened her Bible and the first verse she saw was Psalms 34:20, "He keepeth all his bones; not one of them is broken." She began to weep. She now knew I would not lose my arm. God was telling her all He was seeking was the freedom to do whatever He wanted. Once she was willing to give Him her all, He gave me back to her. My mom realized the context of this verse is actually a prophecy of Jesus on the cross, but God used it in a special way in her time of need. At the time, I was unaware of the struggle my mother was going through. Needless to say, I am glad she got things squared away with God without a lengthy battle. I too learned something from this experience. Up to this point I was afraid of shots, however, a nurse at the hospital graciously helped me over this hurdle. On my first night, she gave me some medicine and I showed my appreciation by giving it back. Of course, it looked somewhat different when I returned it to her. Furious, the nurse yelled at me, "Young man, I have a whole gallon of this stuff and I’ll keep giving it to you until you decide to keep it down!" I do not know what made her think it brought me great pleasure to toss-my-cookies, but I was not about to try to tell her otherwise. Knowing my fear of needles, she tried persuading me to cooperate with threats of a shot instead. To her surprise, I jumped at the opportunity to avoid her wrath and as a result, I overcame my fear of needles. I realize the lesson I learned here has little spiritual significance, but I thought it would help bring back some of your own childhood memories. Playing football is not very difficult, but if a person wants to become an effective strategic player, his personal life must step aside to make room for a higher level of commitment and sacrifice. This same principle applies to being an effective strategic tool for God; our personal ambitions and dreams must step aside so God can fill us with His. A problem with doing the Lord’s work, as opposed to doing His will, is you tend to rely more on your own strength and abilities to accomplish the Christian task. Therefore, the needed spiritual power is lacking. A major danger of doing God’s work with your own strength is spiritual burnout. The reason I am emphasizing this danger is because spiritual burnout and marital breakdown is high among Christian workers. It is easy to get caught up in the zeal of a Christian project and lose the perspective of proper priorities. If a project is causing you to neglect the spiritual or emotional needs of your family, you are doing something that is out of God’s will. Jack, a man from Oklahoma City, developed one of the largest youth clubs in the nation in the mid 1960s. He devoted virtually all of his free time to build this youth club. Yet, because he neglected his family, his wife Carolyn had an emotional breakdown and even contemplated suicide. From a vintage Clint Eastwood movie, came the classic phrase, "A good man knows his limitations." It is essential we understand our limits and pace ourselves accordingly. When a track star is running a 10-kilometer race, he does not run the race at full speed. Running at full speed will deplete his energy prematurely, and he will be unable to finish. We should approach our Christian service the same way. We are not doing God any favors by pushing ourselves beyond our limits. We can do far more for God by living a long, consistent Christian life than by burning ourselves out in five years. 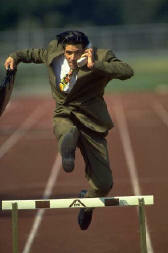 There is an ancient Greek race where the winner is not the first one to cross the finish line. The winner is the first one to cross it with his torch still burning. Sometimes we are so busy with life’s activities that we are in danger of allowing the torch of our spiritual life to be extinguished. There is a real danger that we will run too fast and will be unable to keep our spiritual torch lit. Be aware of the barrenness of busyness and the busyness of barrenness. Having balanced priorities not only means having enough time, it also means having enough energy and creativity. Todd was sentenced to a year in prison. To help himself pass the time, he decided to do some creative writing. Todd was a talented writer and his family felt his material had the potential of being published. So, they suggested that he go back and polish it. Todd said, "Although I obviously have plenty of time, I have a limited amount of energy and creativity. If I were to edit my old material now, I am afraid my current writing would suffer greatly." The game of bowling illustrates the need to give God ALL of your life, not just part of it. 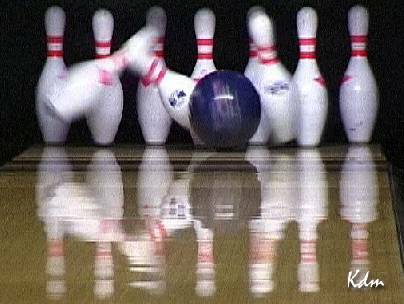 If you knock down 90% of the pins, you will receive 9 points, but if you knock down 100% of the pins, you could receive up to 30 points. Our families, jobs and Christian service all require a certain amount of energy and creativity. God expects us to budget our resources and keep all areas in balance. The passing of time, by itself, can cause a marriage to become stale. Using our imagination and creativity is necessary to keep our marriages fresh and vibrant. If we become overly involved in our job or Christian service, we will be too tired to work on our marriage. Although many people do not realize it, our families are the first expression of our Christian witness. If our personal lives and families are not glorifying to Christ, we have no business seeking another area of Christian service. We must fulfill our first task before we ask God for another. On the other end of the spectrum, once your family is glorifying to Christ, you must spread your creativity to other areas of Christian service. The great baseball star-turned-evangelist, Billy Sunday, got his start working at the YMCA Center. When he first started there, he was told he had to work the same schedule as all the other Y Center workers: 8 a.m. to 10 p.m., Monday through Saturday. (This did not include his travel time to and from work.) I am not going to try to second-guess God’s leading with this dynamic Christian. It is quite evident God’s Spirit flowed through him greatly in his later years. However, I am uncertain if it was really God’s desire for him to spend so much time away from his wife and children his three years with the Y Center. Spiritual, emotional and marital burnout is often the result of unbalanced priorities. No matter how urgent a need seems, God will never lead you to meet it, if doing so will cause you to greatly neglect the needs of yourself or your family. It is not honoring to God to labor in the Lord’s vineyard and kill your own vines. We must realize we are prone to become overactive in our activities, both secular and Christian. Thus, we need to guard ourselves against this pitfall. you are busier than what God intends you to be. Although we must exercise caution in over-activity, when God does lead us into a Christian work, we should give it our all. Nothing should be done for the Lord halfheartedly. He gave His best to us, and we should give our best to Him. When we get involved in a Christian project, we must strive to be as effective and productive as possible. We should not do just enough to get by, but rather we should work to the best of our ability. This means sacrifice, commitment and preparation. In the game of football, some players play far superior to others. It is not always because they have more abilities, but often it is simply because they try harder. They practice more, study more and sacrifice more. Most players have the capacity to play far better then they do. The only thing holding them back is their unwillingness to pay the price. The question we need to ask ourselves is, how much effort are we putting forth? Total commitment is not working on many projects halfheartedly, but giving our all to only a few. The need for total commitment is illustrated by the simple game of bowling. If you knock down 9 pins (90%) you earn 9 points. Yet, if you knock down just 1 more pin (making it 100%) you have the potential of earning 30 points. In bowling, there is not that much difference between knocking down 50% and 90%. But, between 90% and 100% lies the potential for winning the game. This principle parallels our commitment to God. You may have 50% or 90% of your life committed to God, but the real power comes when you are committed 100%. It does not seem that there should be that much difference between 90% and 100%, but for some reason, this is one of the dynamic keys to the powerful, victorious life.